Bhutanese Prime Minister Lotay Tshering was welcomed by his Bangladesh counterpartSheikh Hasina on Friday as the former arrived in Dhaka on a four-day diplomatic visit. 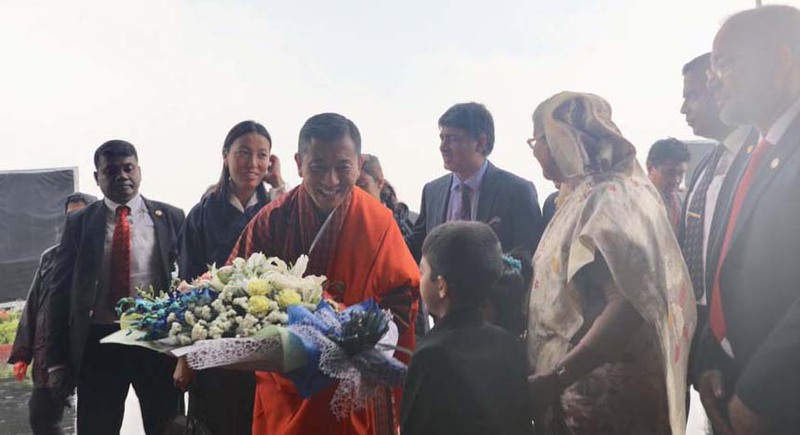 Tshering was greeted to a warm reception at the airport by Prime Minister Hasina. Tshering and his aides landed in Shahjalal International Airport at 8.08 am. The Bhutanese PM was given a guard of honour by a contingent of the armed forces after being received by Hasina at the VVIP lounge of the airport. According to information, Lotay Tshering, who is a alumnus of Mymensingh Medical College in Bangladesh, is visiting Bangladesh for the first time after taking charge as the Bhutan PM. Tshering will participate in the the Bangla New Year celebrations at Dhaka. At the Hazrat Shahjalal International Airport, Lyonchhen was received by Her Excellency Sheikh Hasina, Prime Minister of Bangladesh. As per media reports, this id the first visit by a foreign head of a government since Hasina-led government came to power for a third successive term after winning the parliamentary polls on December 30, 2018. The Bangladesh government, according to reports, hopes to boost the trade relations between the two countries by providing Bhutan an opportunity to use the inland waterways of Bangladesh. A few treaties and memoranda of understanding are likely to signed in the health and agriculture sectors during the Bhutan PM’s tour. On the first day of his visit, the Bhutan premier called on A. K. Abdul Momen, the foreign minister of Bangladesh. This evening, Lyonchhen (Dr) Lotay Tshering was called on by HE (Dr) A. K. Abdul Momen, the Foreign Minister of the People's Republic of Bangladesh. After arrival in Dhaka, PM Tshering also visited the National Martyrs’ Memorial. At the Memorial, Tsheeing offered his prayers for the soldiers who lost their lives during the Bangladesh Liberation War of 1971. Bhutan PM Tshering also had a visit to the Bangabandhu Memorial Museum which was the residence of Bangabandhau Sheikh Mujibur Rahaman, the ‘Father of the Nation’ and the first President of Bangladesh.